I love soup -- please tell me I am not alone in my fandom. Making or eating a hot bowl of soup is supremely satisfying, especially on a chilly day. When I first met my husband, he actually turned his nose up at all soups - and a lot of other foods, for that matter - so I've spent the last nine years trying to convince him of the merits of some fabulous items: tomatoes, onions, cheese and of course, soups. I've had lots of great successes; in fact, the only thing he still completely refuses to eat is cheese. The fact that cheese makes the world go 'round and I die a little inside everytime I walk by wheels of Brie in a grocery store is a story for another day, though. Back to today's story: soup. I like to prepare soups and stews regularly during fall and winter, and my husband and I enjoy eating them while my children act like I'm trying to feed them poison-noodle-soup. You win some, you lose some; and I will keep on makin' those soups, all the while pretending to be oblivious to the melodramatic groans and cries coming from the "dinner haters" in my house. 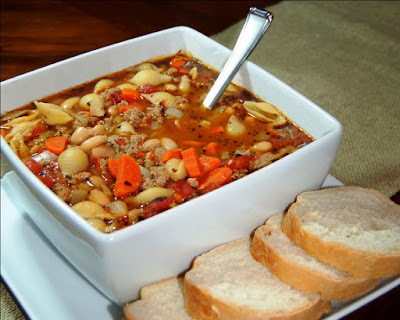 I have a few favorite recipes, and this one for italian sausage soup is definitely in heavy rotation at this time of year. It's quick, simple, hearty, and delicious. And it's even better the second day, true to its soupy form. In a large pot, saute onion and carrot in olive oil until softened, then add garlic and cook a minute more. Add turkey sausage and brown while breaking it into small bits. Add basil, rosemary, red pepper flakes and sage to pot, stir to combine. Add tomatoes, broth, water, and beans, bring to a boil over medium-high heat, reduce heat and simmer for 20 minutes. Stir in pasta shells, simmer another 5-10 minutes until pasta is cooked, and serve. That sounds amazing. I'm totally trying it. Yumm - o! This looks great! I think I may put this on the menu for next week! Hello there! This soup looks so good, I want to reach into the screen to get a bowl! I am going to have to try this, thanks for sharing. That looks so good! I have a picky family and husband who is very suspicious of cheese...and I am a cheese merchandiser! I am going to try this soup out this weekend but will be using real Italian sausage I think....I don't do turkey bacon either. :) Thanks for the recipe! Oh my goodness! I just bought some turkey sausage and wondered what to do with it. I'm going to make your soup! Thanks for sharing, it looks and sounds delicious. Thanks for the recipe Dad. were did that come from (long) try lot. I literally woke up this morning thinking about how much my family loves sausage. I can't wait to try this soup-now all I need is a cool square bowl to serve it in. Been clicking around the blog-dig it. my SIL was just asking yesterday if i had a sausage soup recipe--imagine my joy to see this recipe tonight--yeah! Your soup looks terrific and my mouth is watering a bit at just the thought of tasting it. Hopefully my own "dinner hater" will like it. Anyway, I would love it if you'd come on over and link this up to Foodie Friday. Thank you for linking up to Whats Cookin In The Kitchen on Katie's Cucina! Make sure you stop by again this Friday to link up new recipes!!! Funny my husband is not quite as finicky. He will not indulge in soups most of the time. That's okay more for me when I make this one. I made the Italian Sausage soup tonight and we had friends over. Let me first say I usually do not eat Italian Sausage. Everybody loved the soup. It is our new favoite. I did make 2 small changes. I used 4 cups of broth and 2 onions. Thank you so much for sharing this recipe. بمجرد أكتشاف تواجدها داخل البيت بل و ايضا نستطيع تعقيم و تنظيف البيت عقب القضاء عليها و ذلك ما اتباعه مؤسسة زهرة المملكة و بأساليبها المخصصة حيث يتم التخلص من الفئران و جميع القوارض و طردها خارج البيت و تبتكر المؤسسة فى اختراع الأساليب و التقنيات المستخدمة فى هذا .